We started raising and showing LaManchas in 2009. Over the years we have had many CH(champions), SG(superior genetics), milk * does and +B bucks. Been on milk test and Linear Appraisal. As the herd grew in size it got harder to make it out to shows. In 2014 we became a Grade A licenced dairy and the herd continued to grow, getting up to 130 head. Early in 2019 we did a large herd reduction of the LaManchas keeping only a handful of our favorite does so that we can focus more on the Guernsey breed. In 2016 we added our fisrt Guernsey buck(Walela Liam BG) to the herd to breed to the small group of eared does(1 Alpine, 3 Sables, 6 Saanens & 1 Toggenburg) we had. In 2017 we added our first BG doe(Piurcreek Krumcake) and a new BG buck(Krembrulay Adonis) to breed to Liam's daughters. 2019 is a very exciting year as we have the wonderful opportunity to use a true GG buck on our girls this year. We have strived to breed quality LaManchas for longevity and milk. Dairy character and quality are first and foremost. We are breeding animals that milk and show, and for level lactations that are strong producers from beginning to end. Correct structure for a lasting dairy animal with sound feet and legs. With a well attached mammary system and good teat placement are very important to us and we plan to apply the same high standards in our Guernsey breeding program. I started raising and showing Shiba Inu dogs in 2000. I competed in confirmation, obedience and agility. After 10 years I stopped raising dogs(for a time), got in to dairy goats and got married. My husband(Shannon) wanted a boxer, so in Nov 2010 we added our first boxer Abby. That led to more boxers and in May 2014 we had our first litter of boxer puppies. 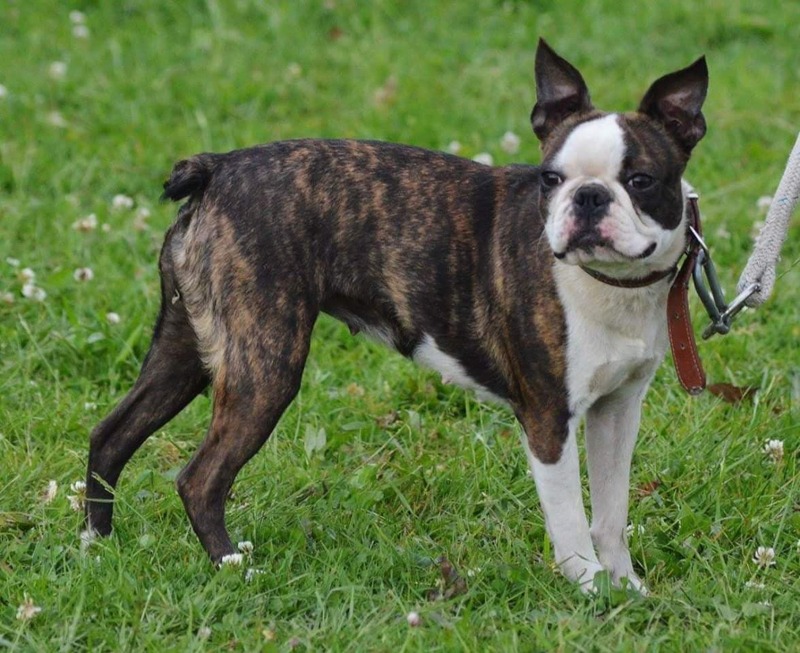 In Nov 2014 we added our first pair of Boston Terriers, Max and Dixie. In 2015 we had our first litter of Boston puppies. Shannon prefers Boxers but I love the Bostons, so we still raise both. In 2017 my mom started raising Standard Poodles. I have come to respect and enjoy this breed more than I would like to admit and some have found their way over to our house. Most of the Poodles are moms though. This website is built and maintained by Just Because Farms. All Rights Reserved. You may not copy pictures or print this site without express written permission from the Owner.